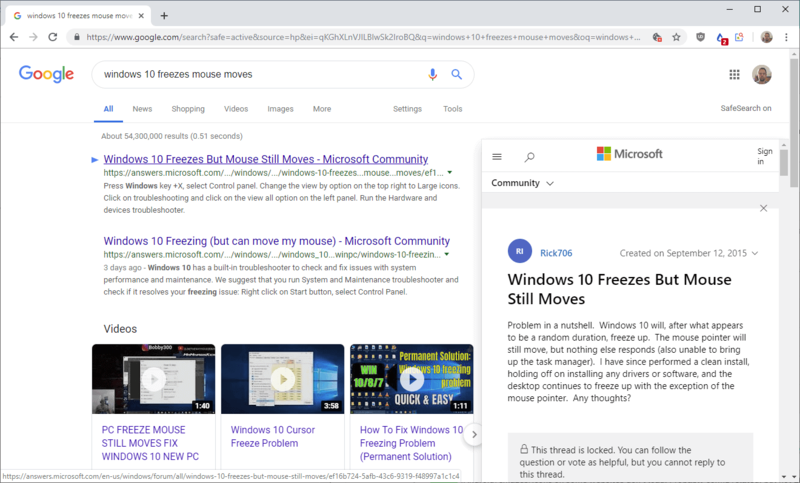 Google Results Previewer is a new browser extension for Google Chrome to preview search results directly on Google Search. Google Search lists page titles, the URL, and some descriptive words for each text-based result in the search results. Previews of search results on Google Search is not a new concept; userscripts and also extensions offered that functionality for years, but most of them don't work anymore today. We reviewed Google Preview for Firefox in 2009 and Results Preview for Firefox in 2015 which added small thumbnails to Google Search, and Google itself experimented with a feature back in 2010 that it called Instant Previews. Preview Google Search requires access to read and change data on websites; it works only on google.com and not on local Google domains. Tip: you can limit access of the Chrome extension by allowing it to run only on user activation. The extension displays a preview of a linked resource when you hover the mouse cursor over a result while on Google Search. Content previews work for search results and Google News results, but not for image, video or site link results. Limitations that sites impose apply; if a site uses a paywall, you will get the paywall message just like you would if you would visit it directly. The preview is shown in the right corner of the browser tab by default. You can move the mouse cursor into the preview area to expand it or click anywhere outside of it to close the preview. The extension does not display previews correctly for some sites; you may get a blank preview or experience other issues when previewing certain sites. Google Search Previewer is a useful extension for Chrome users who use Google Search as their main search engine. The extension should work in Chromium-based browsers like Vivaldi or Opera as well. It is a handy extension for research or troubleshooting, e.g. when you need to find an answer quickly as you can check out multiple results without leaving the search tab. The developer should consider adding local Google domains to the list of supported search engines, and maybe also expand it to support other search engines besides that. Now You: What is your favorite search engine, and why? Work with : DuckDuckgo, Qwant, Yahoo, Bing and Google search engine.